The internet has been in an uproar since Google’s webspam or Over Optimization update launched on April 24th. That update is now officially known as Penguin. What has been a bit lost in the backlash is an important distinction Danny Sullivan wrote about on April 25th – the preceding April 19th Panda Update 3.5 . It’s a difficult distinction to catch on to since both are creatures which reside in popular zoos, usually wear tuxedos, don’t fly and start with the letter P.
All but one of the websites we manage came trough the update unscathed. One has become part of the statistics. An absolute decimation of Google rankings has ensued. Ironically it was the site which saw the largest gains through multiple Panda updates including a site rebuild. Before we proceed let’s be honest – we’re a search engine marketing company who, among other activities, seek to manipulate the search results in our client’s favor. We do so using white-hat link building techniques and optimizing the on-page characteristics of websites following best practices as indicated by Google themselves – but we seek to cause a blip in the algorithmic radar most sites will never receive simply by existing. Call me Jerry Maguire but there is NOTHING “natural” about building or requesting links. The intentions may be as honest and pure white as the driven snow yet this activity is still a far cry from a new mommy who purchased a baby stroller, used it for 5 days then wrote a review on Amazon followed by a post to her Facebook wall with a link to Bugaboo extolling the virtues of their latest creation. We assume her intention, unlike that of an agency serving a client, was to (ahem) ‘do no harm’ to other sites which may rank above Bugaboo for the superbabyroller 5000. Her intent – write a helpful review for other mommies who may find value in the information. That, my fellow dungeon masters, is a natural link. SEO is not dead, but SEO as we know it is. Was the Google ranking hit caused by link profile or content? Many websites lost ranking. Countless webmasters, overwhelmed by a sense of hopelessness even a Leonard gets Penny montage cannot lift, sit and lament. Paralyzed by the unknown and almighty algorithm we look for answers in 64-sided dice, refresh news feeds in 5 second intervals and toy with pivot tables contemplating the same fundamental question: What to change first – Links or Content? Fortunately thanks to the www, unlike most weekend nights in high-school, you’re not alone. We have come to a decision to change content first based on simple data and suggestion Danny Sullivan recommended 6 days ago which many overlooked. To demonstrate we decided to use real-world examples which may help you visualize if your site was bitten by a panda rather than a penguin. April 19th – Google updates to Panda 3.5 which targets low quality content. Sites most affected are those using databases to aggregate information, press portals and aggregators, heavily-templated web sites. If your trafic dropped appreciably between April 19th and April 23rd you have a Panda 3.5 issue and need to work on your content strategy. April 24th – Google introduces Penguin which targets “black-hat webspam”. If your traffic was normal and dropped appreciably on or just after April 24th you have a link profile issue. How to Confirm a Google Rankings Drop Was Caused by Links or Content Using Simple Analytics. All but one client went unscathed during these updates. Ironically they were he client who saw the most gains from the original Panda update. Therefore we immediately began to look closely at the link profile. on close inspection we found some questionable links which might have been negative seo but were in fact caused by sites scraping data as the links still had pieces of ppc tracking urls attached. It was on close inspection of Webmaster Tools data that the dates became suspicious. To confirm our suspicion it was content and not link profile causing the drop in Google rankings we did a simple comparison graph in Google Analytics. 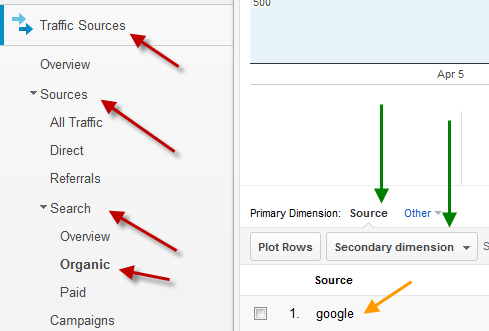 How to drill-down to Google organic traffic in Analytics. We then sorted our dates to show data between April 19th (the date Panda 3.5 went live) and April 23rd the day BEFORE Penguin went live (shown in blue). We then used the compare feature to add the stats from the same previous days of the week April 12th to April 16th (sown in orange). We had our answer. The traffic patterns were virtually identical but the gap with the pre-Panda 3.5 data above told us what we needed to know. Thursday the 12th and Thursday the 19th were nearly identical then they diverged in lock step once Panda 3.5 took hold on the 20th. The result was a 35.73% dip in traffic. Time to change content. If you feel Penguin is the culprit, in a few days you will have enough data to compare the days following April 24th to similar days of the week at the begging of May. Anecdote About The Google SERP Quality Since The Update. After taking a close look at the space post update I have to say the results are disappointing. For a benchmark keyword phrase this client lost 50 positions from position 2 to 52. What is worse for them and Google is that search terms now returns 3 pages each from only two domains in the top 6 positions – totally ridiculous. The seventh ranked site has no content at all – only a new “Ajax Style” scrolling landing page and some links to about us content but ZERO targeting keywords. The phrase they rank for does not even exist anywhere in the content! It is entirely supported by links we have watched and content they replaced months ago with the launch of a new site. What is even worse is one of their exclusively built link farms which has above the fold banner ads pointing to their main site on every page and footer links with similar anchor text linking to the same ranks in the 8th and 12th position. All three of these low-quality content domains, now occupy 80% of the first page, were knocked off the page by the initial panda update. The reason our content is so thematically similar is split testing what text users found compelling has helped us optimize the conversion rate. Perhaps the best metric of quality content is not how unique it is within a domain, but instead how compelling it is to the visitor. A visitor both that website and Google share. GA is prevalent enough to use conversion and usage stats as a measure of quality much like CTR is the driving force behind quality score.